On Wednesday I ran a long distance training race with the Norwegians on a very steep map with rocks and a network of tracks. 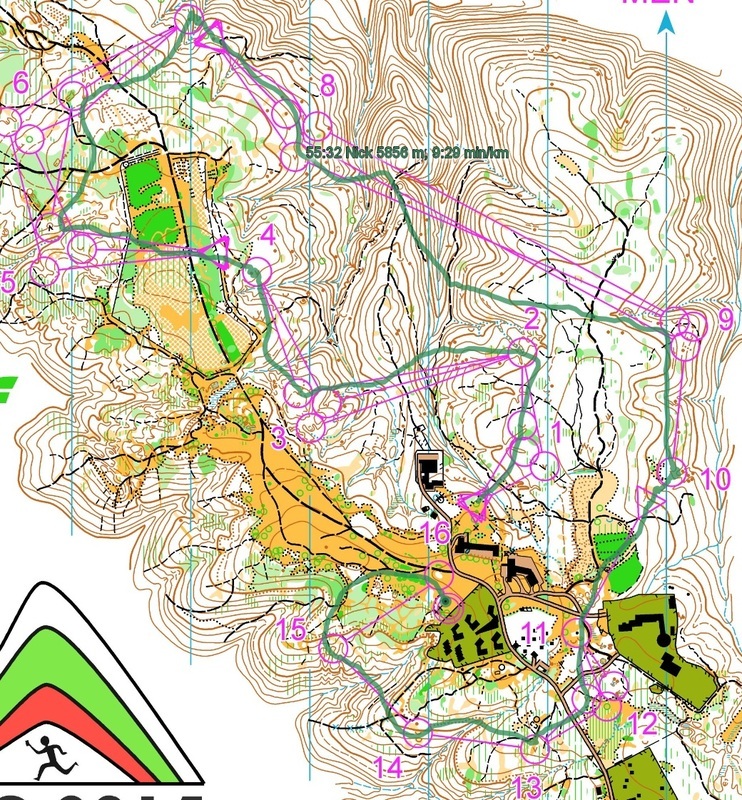 This area is likely to be similar to the southern part of the JWOC long distance terrain. Picking the correct route-choices was essential, as was control through the detailed areas. I ran a fairly good race, apart from where I dropped a lot of time to the third control. The map showed a large depression, so it was that I was looking for. Unfortunately the feature was actually very small, only a couple of metres across, and I ran right past it without realising. I lost about 2 minutes floundering about here looking for a non-existent large hole. After the 3rd, there were a few other time losses throughout the course but mostly it was pretty good. I finished the race 2 minutes behind Borger Melsom, who was 4th in the JWOC long distance last year. He is probably my biggest rival on the camp here and it is good to have someone like that to race against in these trainings. We have had a variety of trainings since then, both in the forest and urban. 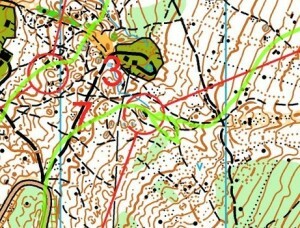 A wide range of map ages (1995 – 2013) and qualities has kept things interesting, but the most fun training has to go the relay-intervals with the French this morning. The group of 6 Frenchmen, 7 Norwegians and 1 New Zealander was a great mix for the four furious o-intervals. The first effort was mass started to simulate the first leg of the JWOC relay. I took the lead before we had even entered the forest and held it to the second control. On the way to the 3rd I was caught in a thick patch of nettles and couple of others snuck in-front while I fought my way through it. However on the last climb up the control I clawed back the lead and held it until the finish. We all started at once again on the second effort. I hung back slightly in the beginning and let two Frenchmen pick the best lines through the terrain. However running the track to the 6th I boosted in-front of them to lead again. This was all groovy until I was smashing it down the spur to the finish at 7 and ran right past the control. I must have been within 3 metres of the flag but I expected it to be closer to the side of the spur and I completely missed it. By the time I had realised and climbed back up, I was in about 6th. The 3rd effort had a relay second leg scenario, where a Norwegian and Frenchman where out in front by 30 seconds, and everyone else chasing them down together. I ran a lot lower than the others to the 8th but arrived there amongst the leaders of the chasing group. A group of about 4 of us were together to the 9th where we were hunting down the leading Frenchman (the Norwegian ran far right – much slower). Crossing the main track before 9, most of the guys I was with disappeared except for one French runner. We took slightly different route-choices but arrived at the finish pretty much together, so I finished in 2nd, a couple of seconds behind him. The last interval simulated the last leg of the relay, and everyone started at 5 second intervals. I was positioned near the back and tried to fight my way through the runners. Because there was limited forking it basically turned into a running race, which was tough on the tired legs. Overall it was a really fun training which was also very relevant to JWOC. 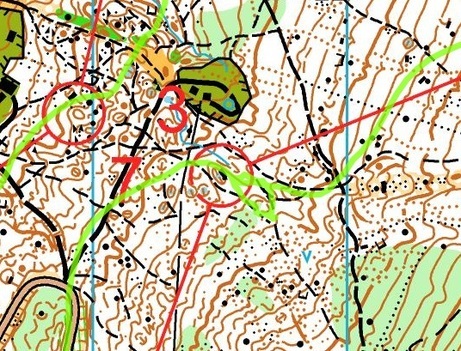 Based on how everyone ran this training, the JWOC relay is likely to be carnage. I have one training left with the Norwegians before I am off to Sofia to meet up with some Australians. It will be good to have a break to recover from this hard week. I am also looking forward to watching WOC and the public race. Good luck to everyone competing there! Shamalicious (malicious or delicious, you choose) is running well too. Check out the ruthless training in the maps section that he ran on Mount Victoria in Wellington just before leaving for Europe. Boom! It is these trainings that makes champions.